But first, a few words about its precursors. The arms race among the makers of American revolvers began in 1865, as Smith & Wesson upstaged their progenitor by building its .32 rimfire Model 1½ pocket revolver under former Colt employee Rollin White’s patent for a bored-through cylinder. Five years later, S&W compounded this insult with injury by procuring a military contract for 1,000, six shot, top break .44 American revolvers manufactured with a bored through cylinder for using centerfire cartridges. It took Colt another three years to retaliate with their first sixgun firing fixed ammunition. But that sixgun was a runaway success, the Single Action Army. The development of the Colt swing-out DA revolvers encompassed William Mason’s US patents 249649 and 250375; Horace Lord’s US patent 303172; and Colt’s inventor, patent attorney, and firearms expert from 1868 to 1925, Carl Ehbets’ US patents 303135, 303827, and 392503. Following unsuccessful attempts to develop a proprietary double action mechanism in the 1877 Lightning & Thunderer revolvers, Colt got it right with Ehbets’ most influential patent, granted in 1888, for a swing-out-cylinder revolver that locked its cylinder in the frame window by an internal pin coaxial with the barrel. The pin was attached to an external latch on the right side of the frame and engaged a depression in the center of the rotating ratchet at the rear of the cylinder. When the latch was pulled to the rear, it disengaged the pin and allowed the cylinder to be swung out to the left, whereupon the cartridge cases could be ejected by pushing on a rod that passed through the cylinder pin and terminated in a star-shaped ejector. This design was shared by all subsequent Colt swing-out-cylinder revolvers. Thus in 1889, Colt got the jump on S&W with the first double action revolver equipped with a swing-out cylinder, arguably the first modern revolver. Notwithstanding these proprietary designs, the actions of Colt’s 1889, 1892, and 1894 revolver series employed a much-modified, licensed version of the European Schmidt-Galand mechanism. (See Ezell, p. 41.) By 1908, they morphed into the beefed-up E-frame Army Special, which overwhelmed the law enforcement sidearm procurement to the point of earning by 1927 the designation of Official Police. These revolvers employed Colt’s V-spring action advertised as having a “Bank Vault Lockup”. It featured a distinctive “double-headed hand” acting as a kind of sacrificial element. Tasked with rotating the cylinder in concert with hand- and trigger-cocking, the Colt hand becomes stressed past its yield point at the moment of firing as it bears the brunt of recoil. As the combustion gases cause the cartridge case to expand, it briefly locks to the walls of the cylinder chamber and transfers most of the recoil momentum to the cylinder, which in its turn bears upon the hand by way of its interface with the extractor star, which at that moment is tensioned by the trigger being squeezed by the shooter’s finger. Colt’s factory authorized maintenance procedure allowed for one-time stretching of the hand by peening. The second time around, the hand had to be replaced with a new factory part. The service interval for this work depended on a variety of factors such as the chambering of the revolver and the use of high velocity ammunition that generates a higher recoil impulse. Meanwhile, Smith & Wesson was developing its own “Hand Ejector” line of double-action revolvers with a swingout cylinder. The First Model of 1896, chambered in .32 S&W Long, locked its cylinder in the rear just like the Colts, while reversing both the clockwise rotation of their cylinders, and their rearward latching. Two years later, Smith & Wesson developed its namesake .38 S&W Special smokeless round, which inaugurated the trend of cartridges developed for Hand Ejectors eclipsing, if not always superseding, their predecessors of the same caliber, originally loaded with black powder. It remains the most popular revolver cartridge in the world more than a century after its introduction. Finally, the last year of the XIXth century saw the First Model of 1896 morph into the first K-frame Military & Police 1st Model. Its main distinguishing characteristic was a second cylinder lock by a plunger built into a lug integral with the barrel. The new revolver was offered as chambered in the anemic U.S. service black powder cartridge .38 Long Colt, as well as the new smokeless .38 S&W Special. The following accolade, cited at length, is typical of its reception by American press. The Smith & Wesson New Military Revolver has many claims for superiority. The Government tests praise it highly. In double action revolvers, notches made in the soft steel of the cylinder, without being reinforced, would soon wear and spread so as to seriously impair the alignment and result in shaved bullets, which is fatal to accuracy. To overcome this wear and spread, a tempered tool steel pin is inserted into the side of the notch which comes in contact with the stop when the motion of the cylinder is checked. The stop is very strong, and is central under the cylinder. The hand which revolves the cylinder has nothing to do with holding it. All such arrangements simply force the cylinder out of line. Another feature is the tempered tool-steel bosses, or collars, fitted into the frame, which, in connection with the raised collars of the lock-studs, keep the working parts central and reduce the friction to a minimum. These lock-studs are not merely pins driven into the frame but are made with large collars and screwed into the frame up to the collar, and stock of frame is compressed around them securely fastening them in place. The locking-pin works through a tempered tool steel collar, fitted into the extractor, and locks into a tempered tool-steel collar fitted into the frame. The cylinder is now locked both front and rear, the locking pins in front and rear being operated by the same thumb-piece in frame. This front lock is most valuable for maintaining alignment. The collar in the extractor is slightly raised above the ratchet teeth and impinges upon the collar in the frame, thus preventing the ratchet teeth from coming in contact with the frame, and saving the cylinder from longitudinal wear and loosening. All these tempered tool-steel bushings, collars, etc., while preventing wear, reducing friction, keeping the alignment, etc., have an additional merit for a military arm that is not often taken into consideration. Being smooth and hard they are less liable to get badly rusted, and if badly rusted, being small, are not so liable to get stuck. For the same reasons dust and other dirt have little effect upon them. The expansion by heat by the most rapid firing possible is not noticeable, one thousand service cartridges having been fired from one of these revolvers in 46 minutes. The loose hammer nose is a valuable feature, much more so than one would suppose at first glance. It is so arranged that its blow is in direct line with the cartridge, thus preventing the weakening of the top part of the primer, as is always the case with the raking blow of the ordinary solid hammer nose. Being loose, this nose permits the use of an aperture the exact size of the nose, and if a primer punctures, as they sometimes do, it cannot block the cylinder by filling in the aperture, as the aperture is completely filled by the nose of the hammer. With the solid nose, the primer is weakened at the top, and it is the top part of the aperture that is open. This is also a very strong hammer nose, and instead of breaking under severe strain, being loose, it will give enough to relieve the shock. In this revolver the barrel is screwed into place, brought to perfect alignment by multiplying gauges, and pinned into position. This is a radical improvement over the method of screwing the barrel against the frame and depending upon the friction to hold the barrel in its proper place. The cylinder is so chambered that the bullet on leaving the mouth of the shell completely fills the end of the cylinder, thus preventing the gas from passing the bullet, or the bullet tipping and entering the barrel more or less sidewise. The barrel is of proper caliber, so that hollow base bullets are not necessary, as in those revolvers where there is no positive cylinder stop. The cylinder is freed out under the extractor to keep any dirt which may accumulate from preventing the return of the extractor to its proper place. The yoke is also freed out so that it will close nicely with considerable dirt in the joint. Many times a mounted officer or sportsman finds it necessary to load with one hand. The little device for preventing the cylinder from swinging loosely, and holding it in open position for loading, will be greatly appreciated at such times. The ammunition for this arm is the regular .38 U.S. Service cartridge (listed as the .38 long Colt), containing 18 grains of black powder, or its equivalent in smokeless, and a 15O-grain hollow base bullet. This revolver is also chambered for the .38 Smith & Wesson Special cartridge which contains 21 1-2 grains of black powder and a solid base bullet weighing 158 grains. This cartridge is more accurate than the service charge and about 30 per cent, more powerful. The revolver is also bored for the .32-20 Winchester repeating rifle cartridge. This is a powerful and accurate cartridge, containing 20 grains of black powder and 115 grains of lead. Still, Colt enjoyed the lion’s share of the law enforcement market. The Official Police, a badge-engineered copy of the 1908 Army Special built on the .41 caliber E-frame between 1927 and 1969, lived up to its name by adding up to over 425,000 sixguns. Unlike Smith & Wesson’s slightly lighter, K-framed Military & Police revolver, Colt’s Official Police could easily digest the powerful .38-44 High Velocity load that S&W reserved for its N-frame revolvers. By mid-Thirties, it had been adopted by the police departments of New York, Chicago, San Francisco, Kansas City, St. Louis, Portland, and Los Angeles, the state police of New Jersey, Pennsylvania, Maryland, Delaware, and Connecticut, and the FBI. Built on the smaller .32 caliber, the Police Positive numbered around 200,000 between 1905 and 1947, and spawned numerous descendants ranging from Bankers Specials to Police Positive and Detective Specials and Diamondbacks built on the D-frame extended to accommodate the .38 Special cartridge. The “Positive” in the name referred to the Colt Positive Lock hammer-block safety, which interposes a steel bar between the hammer and the frame, preventing the hammer from going all the way forward unless the trigger is pulled all the way back. In this regard, Smith & Wesson lagged for several decade. In their early Hand Ejector models, the only hammer safety was achieved by a block with the rebound lever powered by a second leaf spring located in front of the mainspring in the grip frame. It withdrew the firing pin out of the fired primer allowing the cylinder to swing out, but provided little protection against a blow on the hammer. Next came the rebound slide, a more robust assembly that blocked the forward travel of the the hammer after resetting it at the end of the firing cycle. The rebound slide dispensed with the rebound lever spring, allowing the mainspring to move forward. But the rebound assembly was of little use in securing the gun against a drop on the hammer, whereupon the hammer or its pin could break, causing it to fire. This purpose was served by a hammer block located in the sideplate as part of a flat spring preloaded to move ahead of the hammer until pushed back into the sideplate by a horizontally reciprocating cam-shaped pin moved by the cylinder hand. Later on Smith & Wesson simplified this system into a hammer block cammed out of the way by the hand, made much wider from back to front in order to provide this wedging effect. This system was in use at the beginning of WWII. Its one remaining defect was a dependence on springs pushing the hammer block before the hammer. If the spring failed or dirt got in the way, the block might stay out of the way of the hammer, with no external indication that the safety was inoperative. The hammer block was not positive in the sense Colt used that term. By contrast, Colt’s safety did not depend on springs, but was operated mechanically by the trigger. Thus it would not allow the trigger to return unless the hammer block moved into position. In the event of its failure, the trigger would remain in the rear. In December 1944, an American sailor was killed when he dropped his S&W M&P on the hammer. The reports conflict but it would appear the hammer block was frozen into the sideplate and did not spring into position when it should have. In response, Carl Hellstrom redesigned the hammer block safety to be mechanically operated, but differing from Colt in its activation by the rebound slide rather than the trigger. Like Colt’s Positive safety, it prevents the trigger from returning unless the block is in position, and blocks the hammer from moving forward until the trigger has been pulled all the way back. Even if the hammer or hammer pin break, the block will prevent the hammer from reaching the cartridge primer. Both makes had and do have swing-out cylinders and simultaneous hand ejection of all six fired cases. Early models could be fired by a blow on the hammer when six rounds were carried in them but later models, both makes, carried a hammer block to prevent such accidental discharge. Colt double-action parts were soft and trigger pulls would change, while S&W parts were case-hardened glass hard and soon became the finest of all double actions. The Colt had no front latch for the base pin or ejector, while the S&W did and does. The fine old New Century or Triple Lock also carried a yoke lock making three Jacking devices for the cylinder and base pin and even today it is a fine piece of equipment. Colts would shake loose in the crane and yoke from heavy loads and also by some fools slamming the cylinder in place, while the S&W guns stayed tight. To elaborate, the Smith & Wesson action locks the cylinder in the frame at three points: the center pin protruding into the rear surface of the frame’s cylinder window to engage the cylinder release, the cylinder stop fitting into a notch in the circumference of the cylinder, and a locking bolt in the barrel lug snapping into a hole in the tip of the ejector rod. The Colt barrel lacks a lug, and thus its action employs a two-point lockup: a thick cylindrical axle connected to the cylinder release fitting into an opening in the center of the ejector star, and the cylinder stop fitting into a cylinder notch. The extractor rods differ accordingly. The Colt employs a solid extractor rod, whereas the extractor rod on the Smith & Wesson is a hollow tube latched by a bolt in the barrel lug, which contains the center pin, allowing it to move forward when the cylinder is released. The Smith & Wesson action relies predominantly on coil springs, whereas the Colt action is tensioned mostly by leaf springs. Colt locates its removable sideplate on the left hand side, whereas Smith & Wesson places it on the right. The last fundamental changeover in the S&W Hand Ejector design was the mid-century switch from the long to the short action. The short action was pioneered by the D.W. King Gun Sight Company, based in San Francisco, California. Their catalogue ranged from sight replacement to provision of custom grips and hammers, with everything in-between. One of D.W. King’s signature products was the ventilated barrel rib that shifted the balance of the sixgun towards the muzzle and served as a sighting plane and platform for improved sights such as their trademark reflector front sight illuminated with sunlight cast by a mirror embedded into the rib behind it at a 45 degree angle. The full D.W. King target package included the short action for both Smith & Wesson and Colt revolvers, which reduced the trigger pull without repositioning the hammer stud that served as its pivot axis. Smith & Wesson introduced its own version of the short action in the K-22 Masterpiece pre-war 2nd Model. Their original long action had been used until 1948 in all remaining K-frame revolvers, appearing sporadically until 1950 in their N-frame counterparts. Some transitional postwar N-frame revolvers, such as the .38/44 Outdoorsman and .38/44 Heavy Duty, the .357 Magnum, the .44 Special Model of 1926, and the .45 Model of 1917, were built with long or short action depending on the availability of older parts. The short action triggers remained unchanged, but the hammers were reconfigured with a lowered spur, and the frame studs were relocated forward, so as to shorten the hammer throw. In the long action, the hammer stud can be seen on the left side of the revolver directly under the thumb release. In the short action, the hammer stud is staked into the frame about 3⁄32” further forward and higher, causing the firing pin to travel over a shorter arc. Accordingly, the lock time, i.e. the elapsed time between the trigger release and the firing pin strike on the cartridge primer, is shorter on the short action. The trigger arc is the same for both the long and short factory S&W actions, but the long action cams the hammer further back before releasing it. Other factors being equal, the longer hammer fall causes the firing pin to hit the primer harder. Alternatively, given the same firing pin impact, the mainspring, and hence the trigger pull, is lighter on the long action. The shorter the hammer fall, the heavier the mainspring needs to be, to ensure the same firing pin impact. With the same mainspring tension, the long action feels slightly softer and smoother. So much for the mechanics of revolver actions. Now we turn to matters of ballistics. From the 1930s through the 1970s, most U.S. police were armed with various models of Colt and Smith & Wesson revolvers, chambered in .38 Special. The .38 Special ammunition lagged far behind the U.S. military .45ACP and European 9x19mm Parabellum loads in ballistic performance, offering neither the big bore advantage of the former, nor the superior penetration of the latter. While Smith & Wesson was playing catch-up with Colt in securing police and commercial orders throughout the Thirties, their most significant competitive advance occurred when Phillip B. Sharpe and Colonel D.B. Wesson collaborated with Elmer Keith and Remington in developing the .357 Magnum cartridge, chambered by a specially heat treated version of the venerable N-frame, introduced in 1908 in chamberings that ranged from .44 to .455 calibers. The .357 Magnum was soon found to deliver the best stopping power of all pistol cartridges. Its effective range in a long-barreled weapon is excellent for a handgun. Moreover, many types of loadings are available with fully or partially jacketed or hard cast lead bullets, including softpoints and hollow points designed for terminal expansion, armor piercing bullets suitable for hard targets and wadcutters used for bullseye target shooting. This range of projectiles allows the .357 Magnum revolver to exceed the autopistol in ballistic flexibility. And while the heavy recoil and bright muzzle flash of the .357 Magnum may put off inexperienced shooters, this is not a problem for specially trained troopers. The original muzzle velocity of a 158 grain .357 Magnum bullet fired from a 6″ barrel was advertised in 1935 as 1510 fps, motivated by the chamber pressure ranging between 40,000 and 50,000 psi. The 41st Edition of the Lyman reloading manual published in 1957, listed a maximum .357 Magnum load with a 158 grain lead SWC bullet propelled by 15.5 grains of Alliant 2400 powder to 1538 fps. But changes were in the air, as Bill Jordan collaborated with Smith & Wesson on the design and characteristics of the Peace Officer’s Dream Sixgun. The ensuing sidearm was a heavy-barreled four-inch K-Frame revolver with a shrouded barrel and adjustable sights. After a year of tinkering with steel alloys and heat-treatments, S&W presented Bill Jordan with the first Combat Magnum serial numbered K260000 on 15 November 1955. 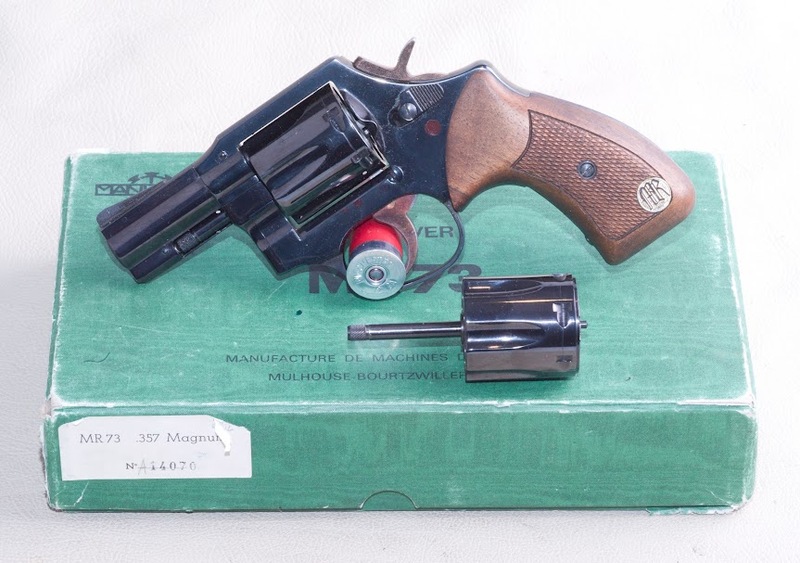 Notably, this original medium frame .357 revolver was designed as a .38 Special revolver that could occasionally fire .357 Magnum, for police officers to carry often and shoot little. Shooters that failed to abide by his mantra of “.38s for practice and .357s for business” soon found their revolvers with fractured forcing cones and stretched frames. As medium-frame revolvers took over the .357 Magnum market, the 158 grain load was downgraded to an advertised 1235 fps, amounting to nearly a 300 fps difference from the original. Even so, the K-frame proved inadequate to the task of full-time .357 Magnum duty. Eventually, Smith & Wesson responded with a tacit concession to Colt’s claims of superior strength by developing its third .357 Magnum revolver line, the 1980 L-frame Distinguished Combat Magnum, designated as M586 in blue steel, and M686 in a stainless steel finish. Its frame window and cylinder diameter were sized similarly to Colt’s .357 Magnum Python revolver built on the .41 caliber I-frame originally meant to house six .384″ bullets. Because the K-frame was known to crack and split its forcing cone with light bullets loaded over hot charges, the L-frame was enlarged to eliminate the cut in the forcing cone of the K-frame, where the cracks occurred. This expansion eventually allowed it to accommodate seven rounds with .355″ bullets. In 1998, the N-frame was endowed with an 8-round .357 Magnum configuration. Meanwhile, the descendants of Bill Jordan’s dream sixgun quietly faded away. Starting in 2005, the S&W catalogue no longer listed a K-frame .357 Magnum revolver. While a larger cylinder size is better at resisting the pressures of combustion, it tends to stress the action more than its smaller counterparts. As the cylinder revolves rapidly, it is brought to a sudden stop by the cylinder bolt entering a notch cut into it, the ensuing stress in excess of the yield stress of the steel resulting in peening. A K-frame is much easier on its lockwork, owing to the far lesser angular momentum of its lighter cylinder. Although the cylinders of the original Smith & Wesson .357 Magnum N-frames were double heat treated, they peened their locking bolts and cylinder bolt notches when fired rapidly either in double action or by thumbing back the hammer, owing to the great momentum of the heavy cylinder. Once the cylinder notches and the frame slot have been peened out, an oversized locking bolt has to fitted. The most durable N-frame actions are the ones fitted with the lightest cylinder. Among the traditional six-shooters, this favors the .45 ACP and .45 Colt M25, followed by the .44 Magnum M29, with the .38 Special Heavy Duty and the .357 Magnum M27 and M28 coming in dead last. Colt responded to Smith & Wesson’s 1935 introduction of the Registered Magnum by chambering it in its largest revolver, the New Service, available from 1898 to 1940 in calibers ranging from .38 to .476. Their only other Magnum prewar offering comprised 628 of its Single Action Army revolvers fitted with specially hardened cylinders. Colt’ next .357 Magnum revolver appeared in 1953 as the double action Model 357, the premium counterpart of its .41 caliber E-frame Trooper. Two years later Colt extended its range with the top of the line .357 Magnum I-frame Python. Dimensionally similar to the E-frame that had the firing pin pivoting on the hammer nose, the I-frame differed only by having a floating firing pin installed in the frame. While Colt’s .41 caliber E- and I-frames lived up to their reputation by withstanding the pounding of Magnum ammo that stretched Smith & Wesson’s .38 caliber K-frames in short order, their Schmidt-Galand V-spring lockwork required more frequent service intervals with heavier loads. Back in the day when police departments had full-time armorers capable of precise hand-fitting, this presented no special problems. But as these specialized skills became harder to acquire and practice, the practical advantages favored less maintenance-intensive designs. We come to consider an toolmaker founded in 1919 in Mulhouse under the name Manufacture de machines du Haut-Rhin, abbreviated as Manurhin. In the wake of World War II, Manurhin started making small arms, beginning with licensed copies of Walther pistols. Initially, the the Walther plant was located Zella-Mehlis in Thuringia, Germany. As a result of Russian occupation of East Germany, Walther relocated to Ulm in Baden-Württemberg. While firearm manufacture was forbidden by the Allied powers, in 1952 Walther licensed the production of its rimfire Olympia target pistols to Hämmerli in Switzerland, and that of its PP, PPK, and P38 series pistols to Manurhin. In 1955 the ban on firearm manufacture expired and handgun production resumed at the Walther plant in Ulm, though early models utilised many parts manufactured by Manurhin. Manurhin produced the Walther designs from 1952 until 1986, when full manufacture and production of the PP and the PPK resumed in Ulm, to continue until 1999. Between 1978 and 1988, Manurhin also manufactured under license by the Swiss company Schweizerische Industrie Gesellschaft the assault rifles SIG 540/542/543. After 1989, the corporate mission of Manurhin gradually shifted away from small arms manufacture to focus on the design and manufacture of machinery for production of military munitions in small and medium calibers. Its swan song, the MR93 revolver, invented by Alain Lechelle and protected by U.S. Patent number 4897950 and U.S. Patent number D316442, and known to the general public mainly through a guest appearance in a Dan Brown potboiler, along with its restyled and updated descendant, the MR96, were distinguished by automated manufacturing techniques that assembled them within four hours of the arrival of an order, out of part stock machined to extremely tight tolerances maintained within 1⁄100 of a millimeter, and with minimal manual adjustment. Regrettably, these remarkable sixguns failed commercially as a result of constabulary sidearm fashions worldwide shifting to autopistols. This failure caused Manurhin to withdraw entirely from small arms manufacture in 1998. Their designs and tooling were acquired by artisanal gunmaker, Manufacture d’armes de tir Chapuis, located in Saint-Bonnet-le-Château of the Loire department of France, where it continues to this day, albeit currently limited to the subject of this study, the legendary MR73. In the early Seventies, the French constabulary faced an extraordinary criminal threat. The country remained awash in weapons left over from its occupation in WWII. Le milieu, the thoroughly updated twentieth century successor of the swell criminal mob (la haute pègre) originally mythologized by Balzac in La Comedie humaine, did not hesitate to employ military grade firearms in bank robberies. The gang of the Lyonnais employed an enviable array of handguns, submachine guns, and assault rifles to great effect in over 35 daring robberies that netted up to twelve million francs apiece between 1967 and 1977. As a result, French police agencies gradually accepted the idea of ​​arming their personnel, traditionally equipped with blowback autopistols chambered in .32 ACP, with locked breech autopistols and heavy duty revolvers chambered in 9mm Para and .357 Magnum. American-style handgun shooting reached Europe in the 1962, with Raymond Sasia, a judo instructor employed as a bodyguard by Charles de Gaulle, who was sent to study the shooting techniques of the FBI Academy in Quantico, Virginia. He returned to France with an FBI certification and founded CNT, the National Center for Shooting Instruction of the National Police (le Centre National de Perfectionnement du Tir de la Police Nationale), a shooting school in Paris that taught range officers, French nationals at first, then foreigners. The latter, upon returning home, taught new range officers. Thus the method “Sasia” promulgated FBI’s revolver shooting techniques throughout the Western world. Meanwhile, CNT sought to develop and adopt a standard issue police sidearm. Sasia’s experience of training with the FBI dictated chambering the revolver in .357 Magnum. At first, Smith and Wesson developed at his behest and on his behalf, a special production run of its .357 Magnum Model 19 revolver, designated M19-3RS, equipped with a 3″ barrel and fitted with fixed sights. 2½” Manurhin MR73 Police/Defense, serial number A14070, in .357 Magnum and 9mm Para In 1971, the Interior Ministry, anxious to buy a French product, expected to number 80,000 revolvers, charged Manurhin with the creation of a new French service revolver. The Manurhin MR73 revolvers ensued from this program. Its titular year saw the production of Police/Defense fixed sight variants with 2½”, 3″, and 4″ inch barrels, in 9mm Para and .357 Magnum. The following year Manurhin rolled out its Match and Sport versions, with 4″, 5¼”, 6″, and 8″ barrels, all in the .357 Magnum caliber. In 1977, it added 3″, 5¼”, and 8″ GIGN (Gendarmerie) versions in .357 Magnum. In 1980 and 1981 came the turn of the MR32 and MR38 Match revolvers in .32 S&W Long and .38 S&W Special, along with the 9″ MR73 Long Range. The centerfire MR range was completed in 1983 with the 10¾” MR73 Silhouette in .357 Magnum and the limited production, stainless steel MR73 10-year commemorative. The MR22 in .22LR and the small-frame 5-shot Remora in .38 S&W Special followed in 1986.The MR range culminated in 1987 with the Convertible model, fitted with interchangeable, tensioned barrels fed by hand-detachable cylinders in .38 Special, .32 S&W Long, and .22LR, with the aid of a frame-mounted firing pin selectable for centerfire or rimfire ignition. 5¼” Manurhin MR73 Sport, serial number A14070, in .357 Magnum, fitted with smooth wraparound Nill stocks Upon its introduction, the French Gendarmerie switched from the Petter-type semiautomatic 9x19mm PA MAC 1950 to these revolvers for its special counter-terrorist unit, Groupe d’Intervention de la Gendarmerie Nationale (GIGN). To this day, these French SWAT units, otherwise armed with a broad spectrum of German, American, and Israeli-made weapons, use the 4″, 5¼”, and bipod-mounted 8″ barreled Manurhin MR73 revolvers for snap shooting and deliberately aimed fire at ranges from point blank to 200 meters. Captain Christian Prouteau was the founder and first commander (1973-1982) of the elite French unit GIGN, one of the best counter-terrorist units in the world. Formed on 1 March 1973 in response to the Munich massacre, GIGN rescued over 1300 hostages under his command and personal leadership of 64 out of its 67 operations. These actions included several overseas strikes, such as the 1976 operation in Djibouti, with 30 child hostages freed, and the 1979 operation in San Salvador, with French embassy personnel freed and terrorists surrendered before a planned assault. In October 1980 Prouteau took 54 buckshot pellets in the head, throat, and shoulders, fired by deranged person armed with a shotgun. A month later he played his guitar and sang at the 7th anniversary of GIGN. In 1981, Prouteau was asked to create Groupe de sécurité de la présidence de la République (GSPR), a unit charged with presidential protection. His request for a support unit for foreign operations led to the formation of the airborne Escadron parachutiste d’intervention de la Gendarmerie nationale (EPIGN) in 1984. To this day, GIGN, GSPR, and EPIGN function as the three special units of French gendarmerie. Appointed as a prefect in 1985, and successively promoted to gendarmerie lieutenant colonel and full colonel, Prouteau assumed the command of security during the 1992 Albertville Olympic games. He retired at the age of 65, on 9 February 2009. On Prouteau’s request, Manurhin developed the MR73 in response to the failures of S&W .357 revolvers at the hands of the French counter-terrorist forces. Each GIGN trooper fired over 40,000 rounds every year with his service weapons. The S&W M19, with its K-frame dimensioned to the .38 Special round, and stressed to accommodate very occasional use of .357 Magnum ammo, was unable to withstand this regimen. By contrast, the MR73 was designed at the outset to be chambered in .357 Magnum. A special cylinder was supplied to use 9mm Parabellum without clips, using the Pilorget system that employed an ejector bordered by elastic piano wire that engaged its extractor groove. The 9mm rimless extraction system was protected by U.S. Patent 3982346. The MR73 allowed for nonlethal outcomes on many occasions. Thus Christian Prouteau neutralized a suspect who was standing behind a hostage. As the negotiations that he conducted deadlocked, the commander of the GIGN, raised his MR73 and fired once at 20 meters away from the suspect and his hostage. The bullet lodged in the shoulder of the suspect. The force of the side impact spun the man away from his hostage. He fell on the ground, stunned but alive. This action exemplified the principle of GIGN use of arms: fire only once, incapacitate with certainty, kill only if there is no alternative. In the same spirit, a GIGN trooper incapacitated with his MR73 an armed prisoner that took hostage the warden of the prison where he was incarcerated. A bullet struck the hand of the suspect holding his weapon. As the man tried to switch his weapon to his weak hand, a second bullet struck the other hand. Again, blood was spilled, but no life was taken, because it was not necessary. The French constabulary counts the MR73 among essential the tools that enable them to resist the temptation of hazardous ease. Although now it seems clear that an autopistol provides the volume of firepower that may be necessary on occasion, the GIGN prefers to reserve them for backup sidearms carried by its operators on their missions, and employ the MR73 as its main offensive handgun. No revolver designed and manufactured in the U.S. after 1911, was intended or suited for combat, as that destination was interpreted by the makers of Webleys and Nagants. Owing to America’s late entry into WWI, none of them were widely and successfully used in trench warfare, in the manner of the LP08 Artillery Luger. Like the S&W M19, its delicate precursor, the MR73 was designed and built for fighting by the constabulary personnel, not for combat by the military. Its typical application took place on the day after Christmas of 1994, when Captain Thierry Prungnaud of GIGN entered the hijacked Air France Flight 8969 plane, grounded at the Marseille airport. He served as the point shooter, armed with a 5¼" .357 Magnum Manurhin MR73 and backed by his partner Eric carrying a 9mm HK05 submachine gun. Prungnaud killed two Islamist terrorists and wounded a third with his revolver, before taking seven bullets from an AK47 fired by the fourth hijacker. In spite of then absorbing a full complement of grenade shrapnel in his lower body, Prungnaud survived the assault, as also did 171 hostages. Not so the four terrorists, who had been planning to deploy the plane as an incendiary missile against the Eiffel Tower. Prungnaud could have armed himself with any firearm. He chose an MR73. His fellow GIGN intervention troopers still choose to carry their vintage Manurhin MR73 revolvers alongside a modern automatic pistol such as a Glock G17 or G19, or a SIG P228 or P2022. Such anecdotes add up to all the data at our disposal, attesting to operator preferences. N.B. : The plural of “anecdote” is “data”. No tool should be evaluated without considering its intended purpose. Like the SIG P210, the Manurhin MR73 was designed and built for an administrative market that formally required extreme precision and durability orders of magnitude greater than that expected from and built into contemporaneous U.S. police sidearms. The aesthetic sensibility of most American shooters derives from an appreciation of fancy sporting goods and service sidearms meant by their makers to be surplused after firing several thousand rounds. Although that is no longer the case owing to the worldwide decline of revolvers in constabulary use, throughout their history Smith & Wesson and Colt never had an economic incentive to forge their gun parts out of tool steel. It was far more cost effective to sinter and machine softer materials, replacing the products under warranty in the rare instances of their being put to hard use. That was not an option for Manurhin in making deliveries to GIGN and SIG, to KTA. Hence the unexcelled durability and precision of their military and constabulary service handguns, combined with a more or less utilitarian finish in most of their variants. GIGN troopers training with Manurhin MR73 revolvers. Squadron leader Prouteau is on the right. Previous Previous post: michael crichton: why speculate?